After a New York harbor patrolman is murdered at the hands of a flesh-hungry ghoul aboard an abandoned yacht, Anne — the daughter of the ship’s missing owner — teams with a newspaper reporter for a private investigation. Clues eventually lead them to a Caribbean island where the dead refuse to stay dead. A voodoo curse is at work, and battle with the bloodthirsty zombies must be joined. This is an excellent zombie movie. The gore and violence are top notch, even by today standards. The scene in which a women is slowly stabbed in the eye with a shard of wood will make anyone cringe. Plus those of us that are obsessed with all things zombie, will also get to see a zombie fight a shark. That alone is worth the watch. The story was good the acting was alright, but this has to be one of my favorite Zombie movies. 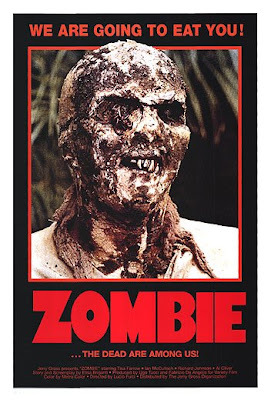 The Zombies from this movie are of the voodoo nature vs. the mutated cosmic viral kind. This is a much watch.